And based on the appreciation for the French political role that your government has played towards Lebanon and the Arabs, that represents a convergence in interests and positions despite some differences in viewing certain issues, which is but natural and realistic due to the particularities of our two spheres; I would like to discuss a sensitive issue to Muslims and even to the secularists who believe in human rights. The matter is regarding the report of the French panel that studied the issue of the veil in schools; you have accepted the recommendations of the Panel, and began the process of turning them into law. We would like to express certain reservations concerning this idea. 1- On considering the head scarf an Islamic religious symbol, we would like to stress the fact that it is a religious duty and that by not committing to it, the Muslim would be committing a sin just like any other religious sin... Therefore, any pressure on the girls towards this end is a violation of the individual’s religious rights, and a practice of persecution against him… The veil is different than the cross or yarmulke that, in as much as we know, does not reach this level. Moreover, we do not imagine that the view could give way to sensitivities as long as the girls wear it on in an ordinary manner, just like any other national or traditional dress. 2- As for considering it an aggression, we do not know how could one’s commitment to what he likes or believes in be seen as an aggression. Does dressing up in a certain way or in accordance to a specific style constitute an aggression towards others? 3- As for accusing the veil of inciting confessionalism, we believe that this is unrealistic and irrational for such a state might rise from debating sectarian issues in school and not from the religious dress. Secondly: Revolutionary France is the Western European country that championed the cause of civil liberties and secularism. In this respect, we believe, as all those who call for freedoms including the United States and Britain; the mother of democracy, that banning the veil violates the rights of Muslim women whether in school, the community or public places. If secularism is not subject to any discussion in France so should be the issue of freedom as the spokesman for the Department of State, as well as some British officials asserted. 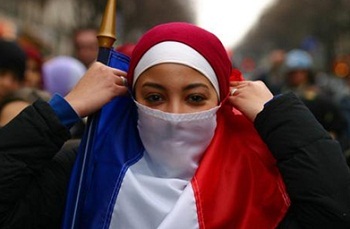 Banning the veil represents a violation of the rights and a suppression of the French Muslim citizen who did not commit any aggression against the law, but does not wish to abide by the laws that are imposed on him and that happens to contradict with his own religious commitments despite the fact that such a commitment neither represents any provocation nor does it lead to turmoil. Thirdly: Has secularism grown so weak that it has become afraid of a piece of cloth or a yarmulke on the head on a cross on the chest? Moreover, the French state has a lot of relations in the Muslim world that might be compromised to the benefit of other states… We want France to remain loyal to the slogans of the French revolution, as well as human rights, and not to establish an anti-religious trend that is hostile to its Muslim citizens. Lastly, we do not wish to interfere in French affairs but based on our religious responsibility, we would like to emphasize, that we, as Muslims, believe in dialogue, especially in matters crucial to the Muslims religious issues, or other vital ones.